A platform called the ‘Global Alliance of Open Access to Scholarly Communications Platform’ (CGOALL) was launched at the just ended WSIS Forum 2019 held in Geneva on the 8th of April 2019. The platform was launched by the United Nations Educational, Scientific and Cultural Organization (UNESCO) and partners and is meant to democratize scientific knowledge following a multicultural, multi-thematic and multi-lingual approach. 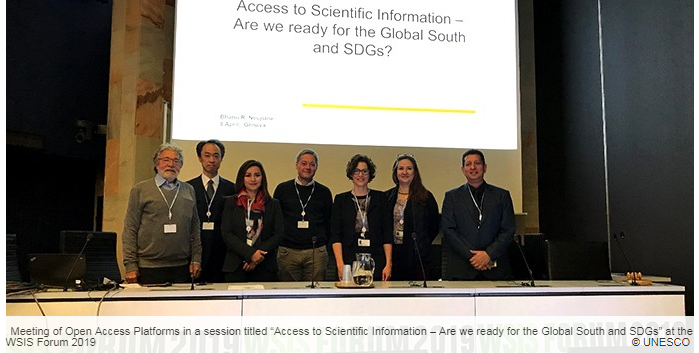 This follows the UNESCO hosting the session “Access to Scientific Information – Are we ready for the Global South and SDGs?” held as part of Action Line C3 and C7 E-Science at the WSIS Forum 2019. It is at this session that coordinators of six platforms – AmeliCA, AJOL , Érudit , J-STAGE, OpenEdition, and SciELO Network agreed to join forces and bring this platform to reality. The platform was launched with a recognition of the principle that scientific and scholarly knowledge is a global good essential for the achievement of the United Nations Sustainable Development Goals. In addition to fostering democratization of knowledge generated in ALL places, subjects and languages, the GLOALL carries a vision to promote the development of multilingual scholarly communication standards, products and services. In the immediate term, GLOALL is expected to generate a unified vision for the alliance based on mutual trust; share experience, technology and know-how that can enhance and foster the development of tools, contents and practices for inclusive Open Access. GLOALL is also expected to improve interoperability among platforms and address language barriers for inclusive knowledge uptake. This session, was hosted by UNESCO on April 8, it discussed measures to foster cost effective mechanisms for sharing, accessing and utilizing scientific scholarship. It provided an opportunity to discuss recent initiatives and underline good practices to support Open Access and Open Science activities in the global south.